Olga Evgenyevna Choubaroff or Chubarova was born on September 23, 1898 in the Caucasus region of Georgia. She was reared in Tiflis, now known as Tbilisi, the largest city and capital of Georgia. Tbilisi is located in east central Georgia on the Kura River, whose headwaters at the top of the watershed in the mountains of northeastern Turkey flow northeast into Georgia then southeast through Tbilisi and Rustavi before crossing the border into Azerbaijan and finally entering the Caspian Sea south of the capital city of Baku. At Tbilisi, the Kura River flows through a valley that is sheltered by the Caucasus Mountains. The range extends from the Abseron Peninsula in Azerbaijan on the southwest shore of the Caspian Sea northwest across the isthmus to the mouth of the Kuban’ River on the northeastern shore of the Black Sea marking the boundary between Europe and Asia with soaring granite peaks reaching an altitude of 18,510 feet at El’brus in northwest Georgia on the Russian-Georgia border. Russia annexed Georgia in 1801, and connected it to the southern end of the Georgian Military Road. The conquest of the Caucasus by Russia began in the same year, and ended in June of 1859 with the surrender of Imam Shamil or Shamyl to Russian troops under the command of General Beriatinsky, the Muscovy Devil. Olga’s great-grandfather Evdokimov or Ermolov was an officer in the Russian Army, and hero in the conquest of the Caucasus and subjugation of Shamil. In February and October of 1917 two revolutions occurred in Russia. The first was the overthrow of the tsarist government, and the second established a Communist state, which led to the Russian Civil War. In November of 1918, at the end of World War I, the White Army, which was led by former tsarist officers, posed a serious threat to the Bolsheviks. Soon, war between the Red Army of the Bolsheviks and the White Army raged along four fronts: southern Russia, western Siberia, northern Russia, and the Baltic region. In November of 1920 the Russian Civil War came to an abrupt end. The Red Army crushed the White Army, commanded by General Pyotr Wrangel, forcing 150,000 civilians and White Army troops to flee Russia from the Crimean Peninsula by the Black Sea to Constantinople. The Civil War caused an estimated one to two million middle and upper class Russians to emigrate. Olga Choubaroff met and married her first husband, a White Army officer with the surname Chagodaeva, in the summer or late fall of 1920 in Constantinople. They may have emigrated before the final evacuation in November, or with those who fled from the Crimean Peninsula. Chagodaeva had been a cavalryman, and was a pilot, at the end of the war. Olga related the story that Chagodaeva was a descendent of Genghis Khan and a prince, who left her his title. Olga Chagodaeva met her second husband, Jose Raoul Capablanca, in the spring of 1934 at a function given at the Cuban Consul in New York. At the time of their meeting, Capablanca was an employee of the Cuban Foreign Office. He had been given a post in 1913, with the tile “Ambassador Extraordinary and Plenipotentiary General from the Government of Cuba to the World at Large,” which allowed him to travel the world playing tournament chess. He was married to Dona Gloria Simoni Beautucourt, and was one of the world’s premier chess players. He had been world champion from 1921 to 1927. Capablanca was born on November 19, 1888 in Havana, Cuba. His father was an army officer and chess aficionado, and Capablanca was a child prodigy, who defeated the Cuban National Chess Champion, Juan Corzo, in an informal match at the age of 12. On October 20, 1938 Olga Chagodaeva and Jose Raoul Capablanca were married in New York. On March 7, 1942 Capablanca suffered a stroke at the Manhattan Chess Club in New York while analyzing a chess game. He was rushed to Mount Sinai Hospital, where he died on March 8, 1942, at the age of 53. Olga relates the story of gazing into the night sky, her eyes focused on a bright star that suddenly disappeared at the moment of Capablanca’s death. General Batista, President of Cuba, took charge of the funeral arrangements, and Capablanca was buried with full honors in Havana. Olga Capablanca married a third time to a much younger man, who was an Olympic rowing champion. In 1967 Olga marriaged her fourth husband, retired Admiral Joseph James “Jocko” Clark. At about the same time, her sister, Marie Blackton, became the second wife of Hamilton Fish III. Clark and Fish purchased a residence on the seventh floor of a large building at 655 Park Avenue in Manhattan. It consisted of two apartments joined by a long corridor. Hamilton Fish was a former Congressman from New York, and a member of an old and wealthy New York family. He had graduated Harvard in 1910, and captained the Harvard football team of 1909. He was an All-American tackle for the Crimson in 1908 and 1909, and inducted into the College Football Hall of fame in 1954. Clark retired from the U.S. Navy as a full admiral on December 1, 1953, and was employed as chairman of Hegeman-Harris Company Inc, a New York construction and investment firm. Clark died July 13, 1971 at the Naval Hospital, St. Albans, Queens, at the age of 77, and was survived by his widow, the former Olga Choubaroff. Clark was buried in Arlington National Cemetery. 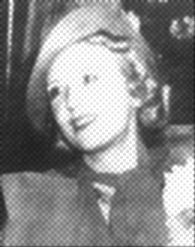 Marie Fish, sister of Olga Clark, and second wife of Hamilton Fish III, died in 1974. Olga Clark christened the USS CLARK (FFG-11), the namesake of her late husband, Admiral J. J. Clark. The frigate was launched on March 24, 1979. Olga continued to live in Manhattan at 655 Park Avenue down the corridor from Hamilton Fish and his third wife Alice Desmond and fourth Lydia Ambrogio. Fish died January 18, 1991, at the age of 102, and was survived by his widow, the former Lydia Ambrogio. Although she did not play chess, Olga was a regular at the Manhattan Chess Club basking in the attention she received as the widow of Capablanca. Olga Choubaroff Clark was very beautiful. She was regal in manner, spoke fluent Russian, French and English, and was intelligent and resourceful. On April 24, 1994 Olga died in Manhattan, at the age of 95. She bequeathed the entire archives of Jose Raoul Capablanca to the Manhattan Chess Club. © 1999-2003 Utility Press Inc. All rights reserved.